Top edge impact protection guard designed for bricklayers, shock absorbing removable end caps, 1 horizontal vial, 2 vertical vials, 1 milled measuring surface, and 2 finger-grip openings. Tough, reinforced aluminium profile developed and engineered for the specific demands of bricklayers. Through the patented top edge impact protection guard, any out-of-line bricks can be corrected with taps of a trowel. Easy handling due to hand grips. Vials accurate to 0.5mm per metre (0.029° = 0.5mm/m), and will remain accurate for 10 years. 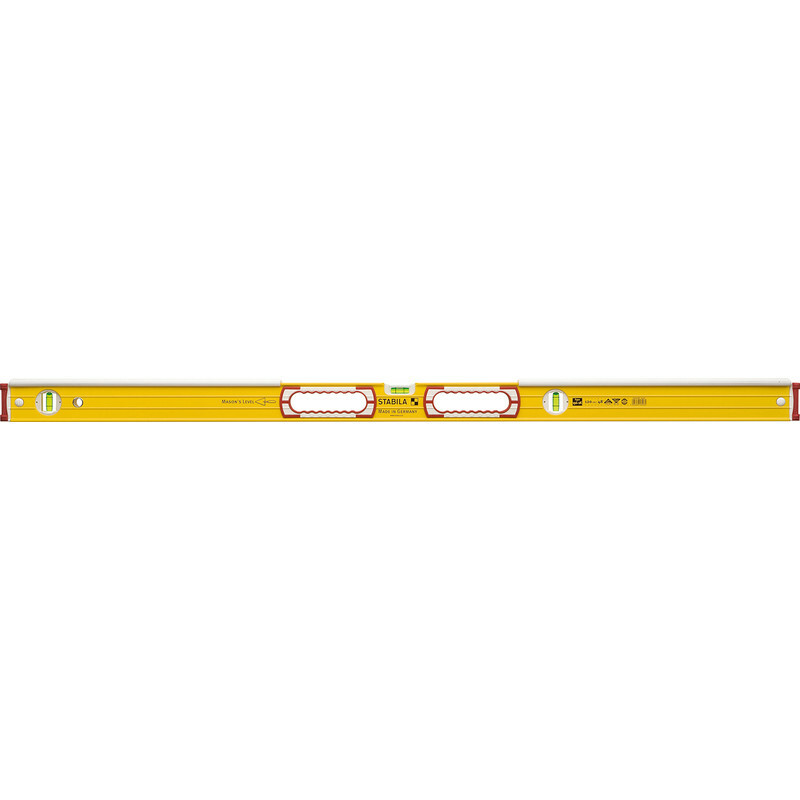 • Ultra-rigid aluminium rectangular profile with patented impact protection for immediate correction of deviations – construction material is aligned with gentle taps on the impact protection, which does not require a change of tool. • Finger-grip openings for easy and comfortable use. • Reinforcing ribs for high stability and a secure hold while working. • Spirit level with one precision-milled measuring surface – no discolourations on the surface on fair-faced brickwork. • Always at eye level – the second vertical vial is offset towards the centre, making it easy to read in all measuring positions. • Shock-absorbing, removable end caps – the two-component material mix protects the profile against impact. • Easy to clean thanks to the electrostatic powder coating. • STABILA installation technology ensures long-term accuracy – measuring accuracy in normal and reverse position of ± 0.5 mm/m. • Features: 1 horizontal vial, 2 vertical vials, 1 milled measuring surface, 2 finger-grip openings, impact protection.